Luna Fatale Creations announces their premier line of Couples Animated Drafting / Artist tables. Each one is a faithful and accurate reproduction of a real-world antique classic. Your avatar holds drafting accessories (e.g. dividers, triangle, pencil & more) and draws in a smooth, high quality animation. AND, the painting appears on the vellum, over time, as you paint. YES, both your avatar AND the painting are animated. View the couples animations for all three tables at the Marketplace. Or come to the store and try them all for yourself. 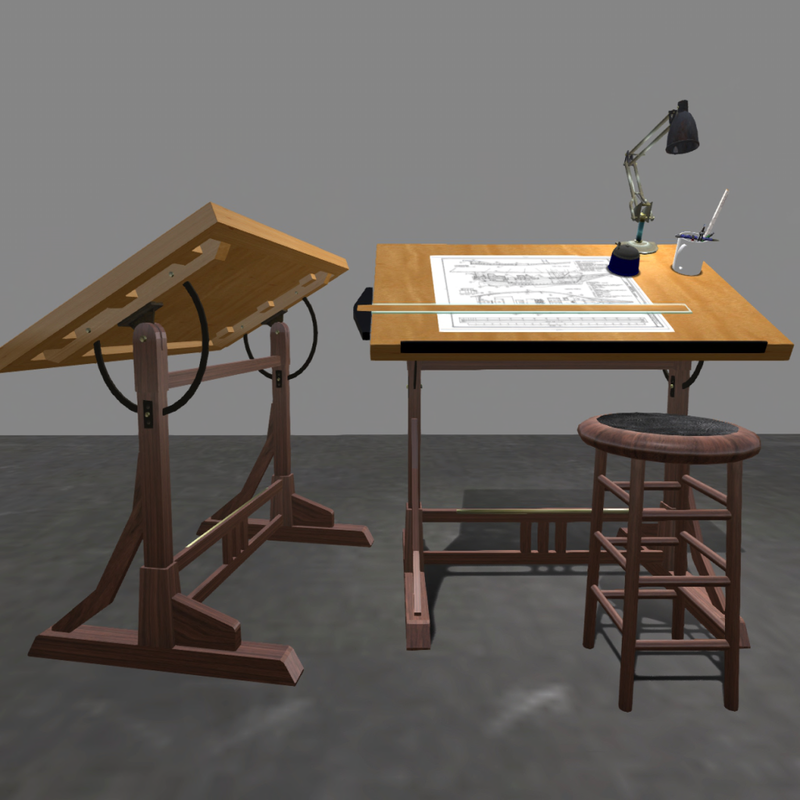 These couples animated drafting table (and accessories) makes a great home or office conversation area or central focus point. It’s ideal for business office, home office or family room. It’s also perfect for your art studio or fashion design workplace. The ensemble is loaded with seven (7) high-quality animations for male and female avatars; including couples animations. There is a robust adjustment tool for personalizing the pose positions and rotations to fit your avatar. Craftsman Style Drafting Table in American Walnut and Curly Maple. 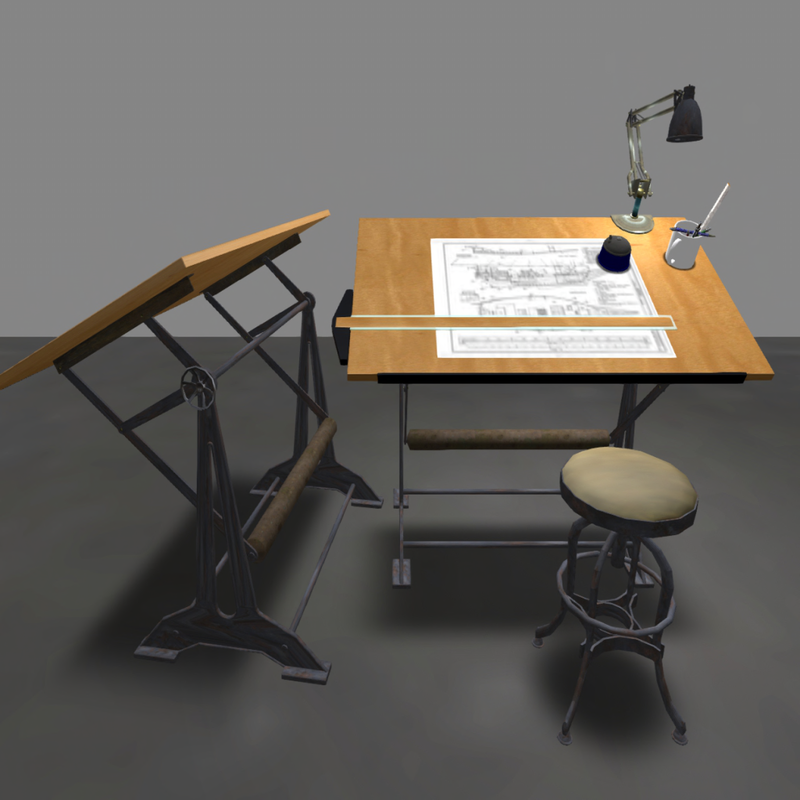 Complete with Walnut and Leather Stool, Three (3) Antique Drafting Table Lamps, Animated Drawings and many accessories. See this product at the Marketplace. Industrial Revolution Style Drafting Table in Distressed Oak, Curly Maple & Iron. Complete with Rusted Steel & Naugahyde Stool, Five (5) Antique Drafting Table Lamps, Animated Drawings, Matching Waste Bin & many accessories. 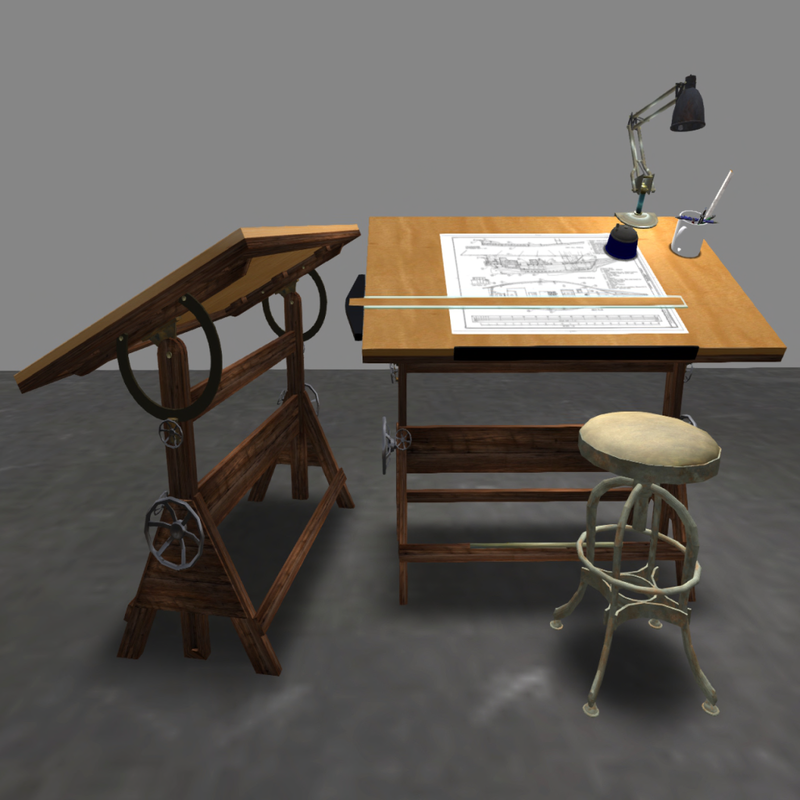 Austrian Classic Style Drafting Table in Cast Iron, Steel & Curly Maple. Complete with Cast Iron, Steel & Naugahyde Stool, Six (6) Antique Drafting Table Lamps, Animated Drawings, Matching Waste Bin, Matching File Cabinet & many accessories. Luna Fatale has the distinction of having 100% 5 star reviews across our entire product line! Luna Fatale creates & sells fine furnishings, art, art accessories & gadgets that we ourselves would like to have in our own Second Life homes. If we can’t find something or we don’t love the things we do find, we build it ourselves and offer a quality, fully featured product to the Second Life community at a fair price. Visit our in-world store to see a demonstration. Be sure to visit the gallery upstairs too. Visit our Marketplace store to view other related items (e.g. “Expansion Packs”) and other fine art accessories.